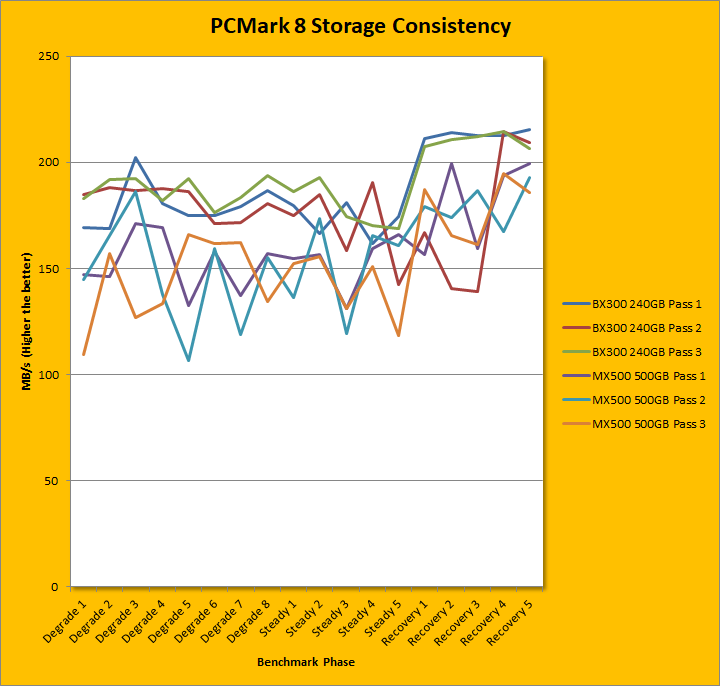 PCMark 8 Storage Consistency Test is one of our favorite benchmarks. Nowadays, many drives are well optimized for high benchmark scores when they are empty, but what separates the professional players from the amateurs is how it stands up to a truly punishing workload. 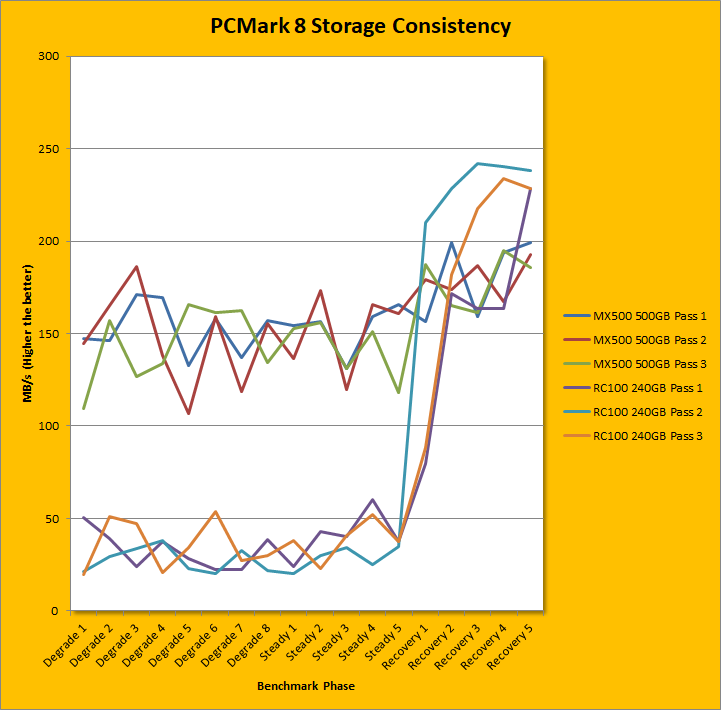 PCMark 8's Storage Consistency Test is designed exactly for this purpose. Going through five phases -- precondition, degradation, steady state, recovery, and clean up -- to extend beyond real world application simulations, this benchmark takes just over two days to complete, but the results are revealing of a SSD's true capabilities. Overall, the Crucial MX500 500GB's results were decent for its class, and the numbers were virtually identical to its 2.5" variant. 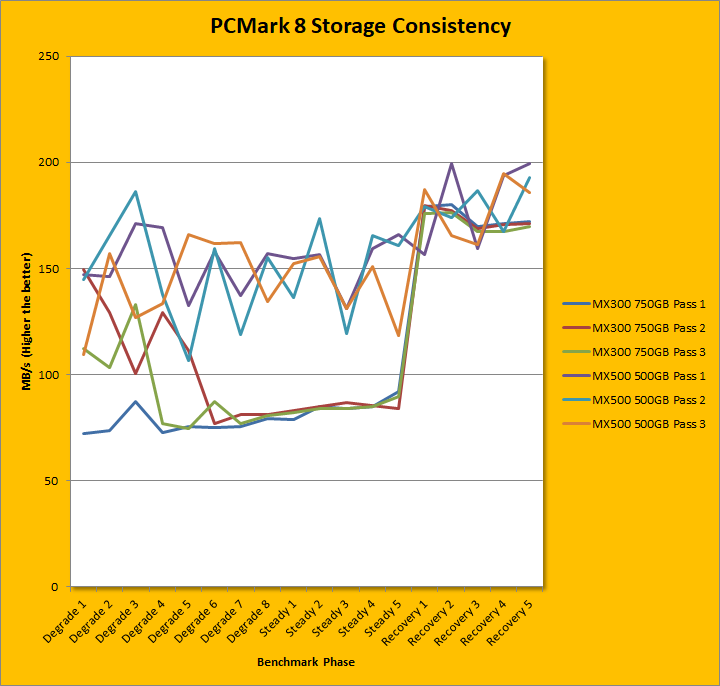 In the first chart, where it was compared against the Crucial MX300 750GB, the MX500 was, on average, 60%, 75%, and 4% faster in its degradation, steady, and recovery phases compared to its predecessor, respectively. This is a significant improvement. In the second chart, where it was compared against the Crucial BX300 240GB, the MX500 was, on average, 19%, 14%, and 10% slower in its degradation, steady, and recovery phases, respectively. Just for fun, I compared the MX500 M.2 against the Toshiba RC100 240GB, a budget NVMe drive. The RC100 managed to catch up only in the recovery phases, but in the degrade and steady phases, the gap was wide enough to fit a nice mid-sized Boeing aircraft... with room to spare. I found this to be a surprising outcome. posted 1 hour and 57 minutes ago, with 5 posts.